Monkeys in Canada are routinely euthanized after medical research, even if they are healthy. But an unprecedented reprieve raises the question: Do we owe animals life after the lab? Cedric, a former lab monkey who spent his life inside a research facility, is part of an unprecedented experiment to see if such animals can be rehabilitated, instead of being killed. At seven in the morning, they came and took him away. He didn’t know where he was going, but there was a lot he didn’t understand. One thing was certain; he’d never left this place before. His name is Cedric. He enjoys sitting in buckets, playing with sticks and having his feet tickled. His favourite foods are watermelon, bananas and bok choy. And at the age of 10 – not yet midlife for a monkey – he has outlived his usefulness. Cedric is a lab monkey – a grey, somewhat pudgy, long-tailed macaque, imported to Canada from a breeding facility in the United States that churns out primates for research. He’s never been outside, never climbed a tree, never foraged in the wild. His life has been lived almost entirely within the confines of a cage that is four-feet long, four-feet wide, and eight-feet tall. His contributions to science are unknown beyond the lab. The research facility has refused to divulge any information about the work he was involved in. Whatever experiments were performed, though, they would not have been easy on him. We know this because Cedric was not expected to survive. But he did. So what should be done with him now? Does he deserve to live? There are 6,412 non-human primates deployed in research across the country, housed inside university medical schools and pharmaceutical laboratories. 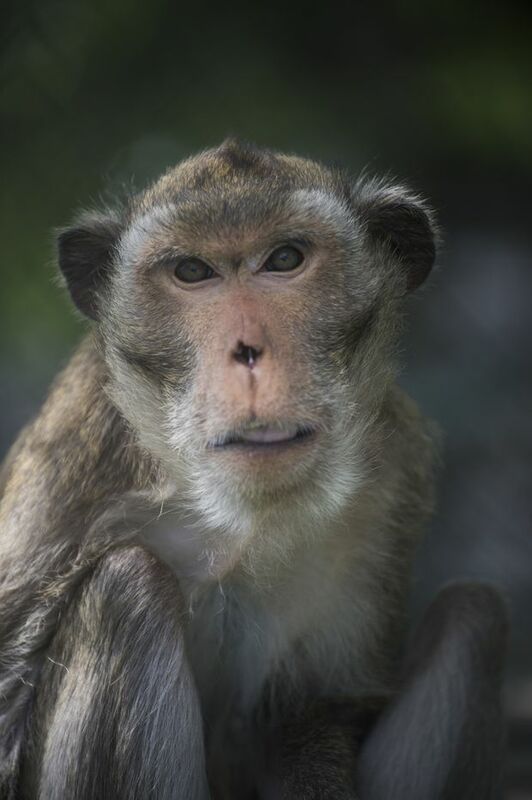 They are used to test new vaccines and drugs for efficacy and toxicity – a requirement under federal health regulations – or to better understand human diseases and neurological conditions, because a macaque’s biology is so similar to our own. But research monkeys in Canada never make it out of the lab. Some end up too sick or traumatized from the experience, or are deemed too expensive to keep around after the work is complete. Zoos don’t want them. And because they’ve never had to fend for themselves, releasing them into the wild is not an option. When the research is done, lab monkeys, even the healthy ones, are killed. But this spring, Cedric was handed a different fate. Instead of a death sentence, he and two other research monkeys were given something unprecedented in Canada – a shot at retirement. On an overcast morning in May, Cedric and the others – a 12-year-old named Cody and a 13-year-old named Pugsley – were loaded into a large white moving truck. It drove them from their lab to a farm in rural Ontario, which houses Canada’s only government sanctioned monkey sanctuary. 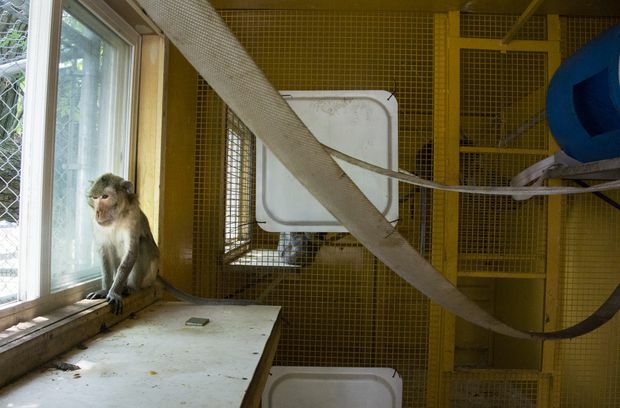 Though there may have been cases where research monkeys were secretly liberated from facilities in the past, this was the first time federal and provincial authorities have approved a formal effort to rehabilitate them. It is an agreement that challenges a century of status quo within the scientific community, testing the default assumption that death, for research animals, is the only outcome. It required the lab and the sanctuary to set aside their philosophical differences, and the federal government to bend its own rules. After years of taking part in research designed to help people, Cedric and the others are now involved in a groundbreaking experiment that could have lasting impacts for other monkeys. It is a test case that, if successful, could lead to more like it. But there is work to do. After years inside the lab, they must first be disentangled from the only life they’ve ever known, and learn to become something they’ve never been: regular monkeys. Cedric (facing camera) is groomed by Pugsley, while Cody sits in the background. 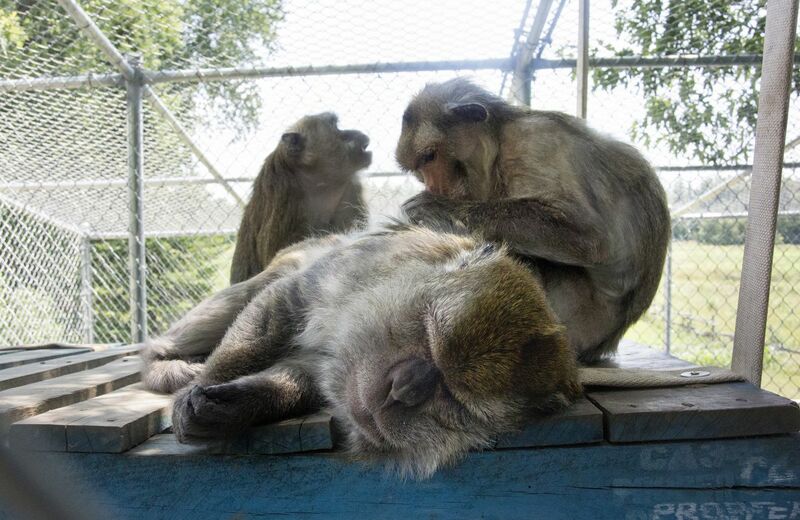 At the sanctuary, the three monkeys are learning to adapt after their old lives in a lab. Life outside the lab began inside, with four weeks of quarantine. From a window in their new enclosure, Cedric, Cody and Pugsley could see out, even if they weren’t sure what they were looking at. The outside world was filled with strange things: a barking dog off in the distance, other monkeys in nearby enclosures and a barn cat making its rounds. It was all brand new. The Story Book Farm Primate Sanctuary sits on a five-acre parcel of land next to an old farmhouse near Sunderland, Ont., about a 20-minute drive south of Lake Simcoe. It is a pastoral setting, with rolling hills and swaying trees. On days when nearby farmers cut hay, the air smells sweet and grassy. But the sanctuary’s story is also one of survival. 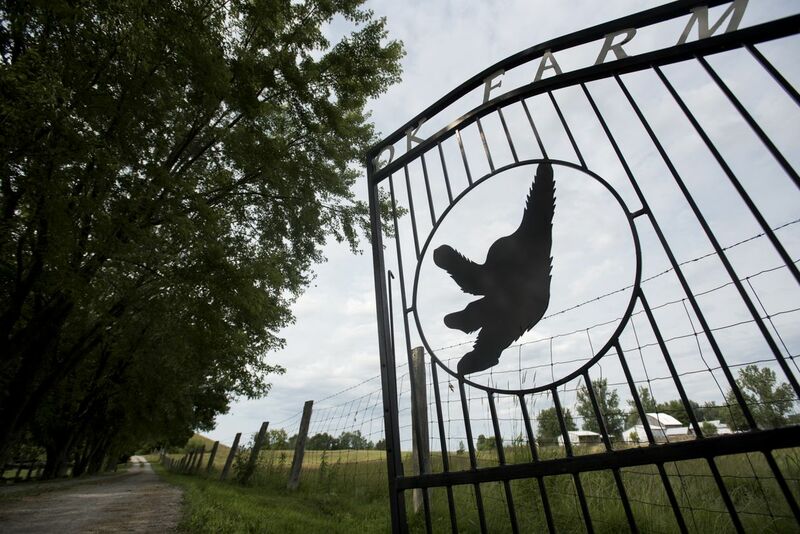 But three years ago, Story Book Farm faced an uncertain financial future. That was when Daina Liepa stepped in. Her daughter, a primatologist who volunteered there, introduced Ms. Liepa, a former ad executive, to the sanctuary and it didn’t take long before she was hooked. The moment of her conversion came when a spider monkey named George reached out for a hug at the end of a long day. He wrapped his long, shaggy arms around her shoulders and held on tightly. From then on, Ms. Liepa couldn’t let go. She mortgaged her home to help buy the sanctuary and signed on as a director and chief fundraiser. She now canvasses the country looking for grants and donations to keep it going on a shoestring budget. On Tuesdays and Saturdays, she dons khakis and white rubber gloves and pitches in to clean the enclosures and chop fruits and vegetables into large salads for the 19 monkeys it houses. Unfortunately, it wouldn’t be a simple handover. The expenses were an obvious problem, but there were far bigger hurdles: Though lab monkeys are allowed to retire in other countries, including the U.S. and Australia, Canada has been an outlier. Federal regulations contain no mechanism to remove healthy animals from research. The Canadian Food Inspection Agency (CFIA), which oversees the importation of animals into the country (even those that aren’t food), stipulates that a lab monkey is always a lab monkey. It lives there, and, regardless of the circumstances, dies there. Ms. Liepa, a 68-year-old with wavy blonde hair who speaks softly but deliberately, set out to change the CFIA’s mind. After months of talks, with the monkeys’ lives hanging in the balance, she convinced the department to bend its rules. As long as the monkeys were physically healthy and passed a month-long quarantine, the government would allow it. 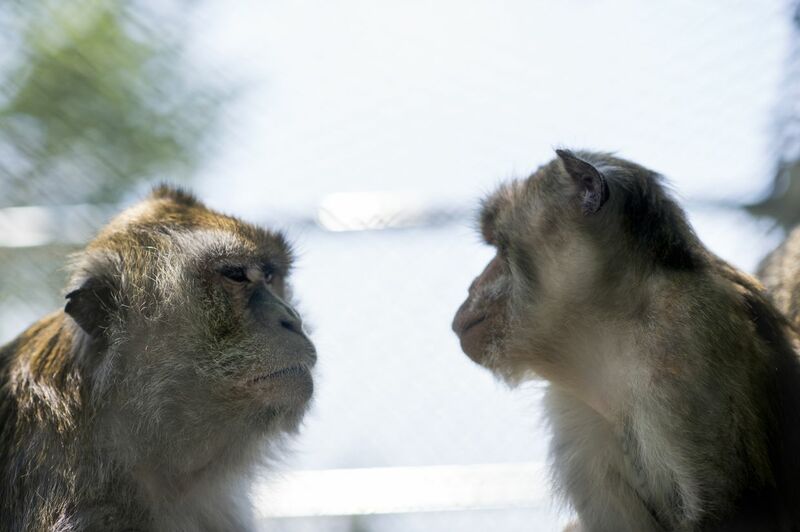 Under the agreement, two monkeys – Cody and Pugsley – would retire at Story Book Farm and undergo rehabilitation. Pugsley, an undersized runt imported from China, got his name because he reminded the lab employees of a pug, with his squished nose and bad teeth. Cody, who is huskier and was purchased from a breeding facility in the U.S., reminded them of a Kodiak bear. Pugsley got his name from his squished nose and poor teeth, which reminded his keepers of a pug. Pugsley had his quirks: he was captivated by mirrors and aggressive around food. Cody was more laid back. He enjoyed ripping the pages out of books, as a toddler might, and sitting on a hanging tire on days he was let out of his cage into a small play area at the lab. But as the plan came together, things suddenly changed. The third lab monkey was the youngest of the three, but he looked mature and distinguished, with dark eyes and a perpetually furrowed brow. He also came with his own hang-ups. When researchers at the lab played DVDs to keep the monkeys occupied, Cedric developed a hatred for the movie Shrek, which deeply upset him. When the day finally arrived, the monkeys were unloaded from the truck and placed directly into an indoor enclosure at the sanctuary roughly the size of a small bedroom, with Pugsley and Cedric rooming together for the first few days, and Cody in an adjacent space. There, they would be closely monitored for signs of illness or distress. While slightly cramped, the accommodations were palatial by comparison. “Regardless of what we can provide for them, it’s certainly better than a 4x4x8 cage,” Ms. Liepa said. The monkeys had likely been subjected to invasive research. In addition to monitoring their physical health, the sanctuary also watched how they coped with the transition, keeping track of any unusual behaviour changes. Amy Kerwin, who runs a sanctuary in Wisconsin, said lab monkeys typically come with a reputation as lost causes due to the physical and emotional baggage they bring. One of the monkeys reaches beyond the enclosure to grab a blade of grass. The monkeys got their first taste of open air on their 28th day at the farm. On their fourth week at the sanctuary, with the summer setting in, Cedric, Pugsley and Cody were huddling in their enclosure when they noticed something unusual: the window was open. What was this? For several minutes they just looked at it, and then at each other. Eventually, Cody lumbered up to the opening. Judging by his body language – tentative bordering on reluctant – he wasn’t sure what to make of the situation. In a lifetime of confinement, he’d never come across an open window before. He stepped gingerly through the opening, eyes darting around. On all fours, he slowly made his way down a ramp to the ground. Most people don’t remember the first time they went outdoors. Outside just always seemed to be there. Cody had spent most of his life standing on the thin metal bars of his cage – he had never felt solid earth beneath his feet. He took one small step, then another. The ground was soft and lush. A greenish canopy stretched overhead. Beyond that, an expanse of blue. It was a lot to process. For a moment, he just sat on the ground and looked around. He plucked a blade of grass and held it to his nose. Then he grabbed a fistful and began munching quietly. Soon, the other monkeys joined in. They ate, climbed and jumped, and for long stretches, they gazed up at the sky. Birds flitted overhead. They’d never seen a bird before. 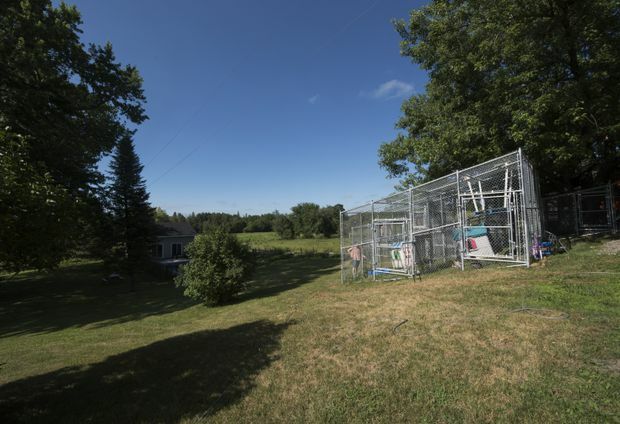 The caged outdoor area was roughly the size of two small bedrooms, enclosed by 10-foot high reinforced chain-link fence, with a runway connecting the indoor enclosure. It cost around $30,000 to build. 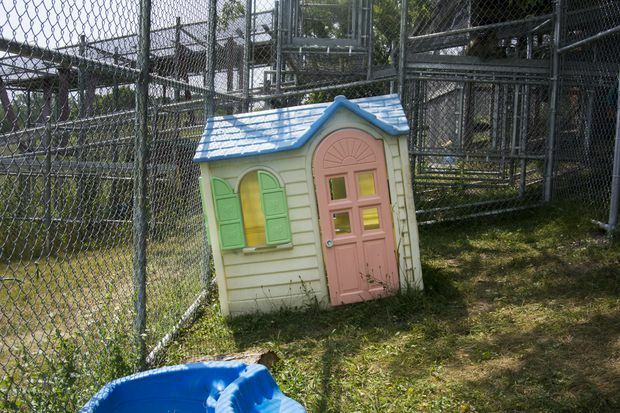 Inside the fence were two children’s playhouses, the colourful plastic kind sold at Canadian Tire, donated by a family whose children outgrew them. Suspended from the top of the enclosure was a wooden platform to swing on. The monkeys have a covered outdoor area surrounded by a 10-foot-high fence. The enclosure contains plastic children's playhouses and a wooden platform to swing on. In the wild, long-tailed macaques are a particularly clever breed of monkey. Found throughout Southeast Asia, observers have seen them use rocks as tools, shards of wood as toothpicks and washing food before eating it. They are also an attractive substitute for humans in scientific research. Their brains, though one-tenth the size of ours, are similarly wired. So are their immune systems. Their bodies respond much the same way to diseases, infections and medicines as ours do. This is why they are so useful. Some of the biggest medical breakthroughs of the past century would not have been possible without monkeys like these. Polio was cured after researchers tested the vaccine extensively on rhesus macaques, by injecting the virus into their spines. By even the most conservative estimates, more than a million lab monkeys were killed in the race to solve the crippling disease. Scores of other breakthroughs – from organ transplants to advancements in cancer and diabetes treatments, to schizophrenia and Alzheimer’s research – have all relied heavily on lab monkeys. They are now on the frontlines of research into the Ebola and Zika viruses. In Canada, as in the United States and European Union, new medicines and vaccines must be tested on animals before they can be put through human trials. In 2017, there were 4,415,467 animals used in scientific research, according to federal data. More than three-quarters of those were fish, mice or birds. Of the 6,412 non-human primates in research last year, 91 per cent were macaques. The Canadian Council on Animal Care, which sets out guidelines for the industry, lists five categories of experiments based on invasiveness, ranging from procedures that cause little or no discomfort, to those that cause severe pain. 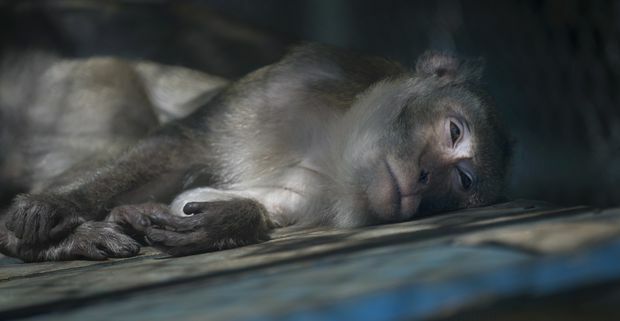 In experiments performed on macaques in Canada, 2,046 were exposed to moderate or severe distress, while 64 of the monkeys experienced pain beyond their tolerance threshold. The U.K.-based Medical Research Council, which oversees the industry in Britain, acknowledges the use of monkeys in research is particularly sensitive. The organization’s ethical guidelines state that the “least sentient” species be used, whenever possible. Sentience is defined as the animal’s conscious awareness of the world and of itself. Primates are highly sentient, with mental capacities equal to that of young children. In many instances, the genetic makeup of mice, rats and fish are similar enough to humans that primates aren’t needed. But they are not always a reliable proxy. When thalidomide – the notorious drug that caused deformities in babies – was put on the market as a remedy for pregnant women’s morning sickness, it had been shown to be relatively harmless in pregnant rats. But there were clues the data was flawed. Thalidomide made people drowsy. However, this side effect didn’t show up in rats, a hint that they were metabolizing the drug differently than humans. It wasn’t until researchers later tested the drug on baboons that the telltale deformities such as missing ears and stunted limbs emerged in their babies. The role of monkeys in thalidomide testing was crucial to getting the drug pulled off the market, though not fast enough. Science is attempting to replace animal testing with high-tech options. From computer simulations to experiments done on cell cultures, but for now, lab monkeys are considered the closest stand-in medicine has for an actual person. Ms. Blum recalls a particularly haunting moment she witnessed inside the University of California’s animal testing lab. To study the harmful effects of air pollution, baby macaques were placed inside an airtight chamber, which was then filled with toxic air for them to inhale. It’s a troubling ethical quandary. We would, of course, never use children in such a study. Instead, researchers slice up the lungs of baby macaques, on the grounds that the findings – perhaps a new insight into lung cancer – will justify the toll. Pugsley is the smallest and most aggressive of the three monkeys. Ms. Meehan, a calm, bespectacled woman with long salt-and-pepper hair, is the resident monkey whisperer – a zoologist who studied memory function in spider monkeys and now splits her week between the sanctuary and her job at the Toronto Zoo, where she has worked with primates and other animals for 30 years. Her role is to keep a close eye on how the monkeys interact and – hopefully – improve, compiling that information into a report for the government. Every now and then, she would pause, scribble down a few notes and return to watching the monkeys as if she was babysitting preschoolers. Looking closely, there were signs the monkeys came from a lab: Cody has a hole punched in the tip of each ear, where a tag probably was, and each of the macaques have a large tattoo on their chest – a series of letters and numbers that have faded over time. Cedric is also missing half his tail – for reasons that are not clear. Cedric, left, is missing half his tail. Cody has holes in the tip of each ear. The Globe and Mail sent a list of questions to the lab, relayed by email through Ms. Liepa so as to not violate their confidentiality agreement. The questions sought basic information on how the monkeys were treated and what research was performed. One question asked why Cedric was missing much of his tail. The lab refused to answer. Ms. Meehan watched carefully for signs of abnormal behaviour such as lashing out, an inability to socialize with others and self-mutilation. Captive monkeys sometimes bite themselves, or tear out clumps of hair when they are depressed or scared. In the worst-case scenarios they’ve been known to chew off their arms or tails. Ms. Liepa was pleasantly surprised by how calm the lab monkeys appeared upon arriving at the sanctuary. Only Pugsley seemed to be on edge, sometimes taking swipes at the other monkeys. Some primates have a much harder time adjusting to their new lives. 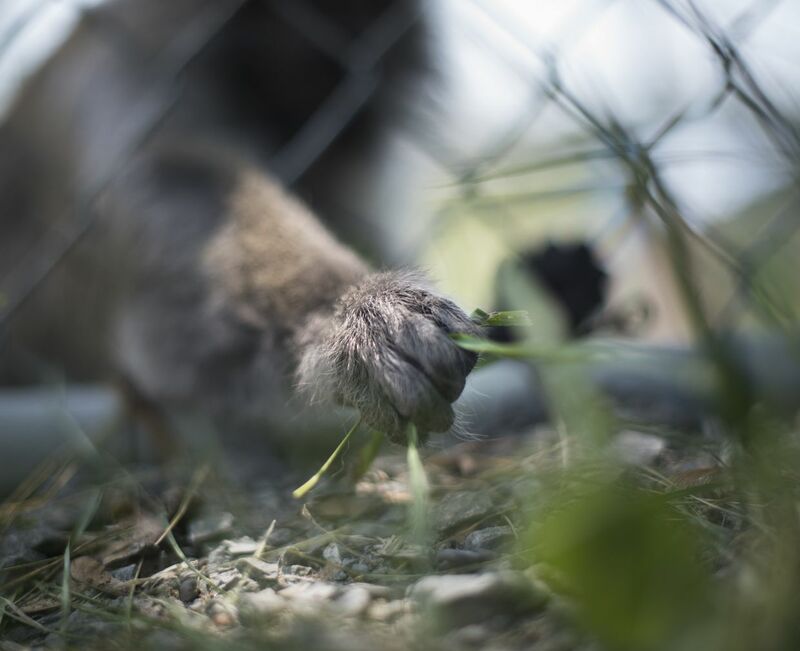 One macaque that came to Story Book Farm after escaping an illegal roadside zoo took years before she would even accept a grape from the staff without lashing out. Several weeks after arriving at the sanctuary, though, the peaceful situation among the lab monkeys changed. On a sweltering afternoon in mid-June, the look on Ms. Liepa’s face suggested something was wrong. “We’ve had an altercation,” she explained, her voice threaded with concern. A few days earlier, staff at the sanctuary heard a sudden clatter coming from the enclosure. When they arrived, they found Pugsley bleeding. They could see a deep red gash on his shoulder, another down his side and one on his forearm. Nearby, Cody sat with his back to them. 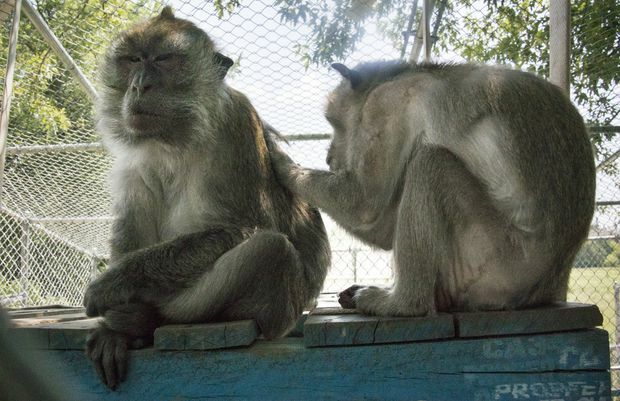 Ms. Liepa placed an emergency call to Dr. Izzy Hirji, a veterinarian and monkey specialist based in Toronto that the sanctuary keeps on standby. It was unclear what happened. Pugsley had been attacked, and one of the monkeys had sunken his sharp canine teeth deep into Pugsley’s flesh. No one knew which one, or why – though Cody’s body language spoke volumes. In their first six weeks at the sanctuary, Pugsley, though undersized, had been the most aggressive of the three. He stared down humans who came too near the enclosure, jaw open and teeth bared – which is monkey-talk for aggression – and often challenged the other monkeys. At dinner time, Pugsley stole the best bits, grabbing whatever fruits or vegetables he liked most. On Cedric’s birthday, when they were each given a marshmallow, Pugsley ate two of them. Cedric paid little mind. But Cody, timid and standoffish when he first arrived, was gaining confidence and beginning to assert himself more. At 26 pounds, he was nearly double Pugsley’s size. It would have been no contest. Such violence is not uncommon in nature. Philosophers and anthropologists have long argued that humans are the most violent of the primates, waging large-scale wars on each other, but monkeys and apes are no strangers to aggression, particularly when they seek to enforce their social order. But it wasn’t until Mr. de Waal examined the ape closer that he realized just how violent the fight had been – the chimp was missing his testicles. He soon died. It was nature taking its course, perhaps, but Mr. de Waal called it the most difficult moment of his long career. Pugsley’s injuries were far less dire, but no less urgent. When Dr. Hirji arrived at the sanctuary, he anesthetized Pugsley. Working outside, Ms. Liepa used the light of her cellphone to illuminate the night as the veterinarian moved quickly, sewing dozens of stitches to close the wounds. A veterenarian attended to Pugsley's injuries after the incident. Pugsley’s behavioural issues may stem directly from his life as a research animal. Born in captivity and sold into research, the lab monkeys have not been properly socialized as they would be in the wild, growing up among peers, inside a family unit and with the guidance of their mother. Quite simply: they don’t know how to act. These details are contained in an internal lab manual the company created on long-tailed macaques, which was obtained by The Globe and Mail. Separating the monkeys from their mothers makes it easier for them to bond with humans. They are housed with other primates until nine months before shipment, when they are placed inside small cages, alone, to prepare them for life in the lab. The manual comes with a warning: a monkey separated from its mother, or from other monkeys, may struggle later in life. “The younger the monkeys are when they begin living alone or in the nursery, and the larger the portion of their lives they are alone, the more likely they are to develop the behavioural problems,” the manual states. The separations take an equal toll on the mothers. 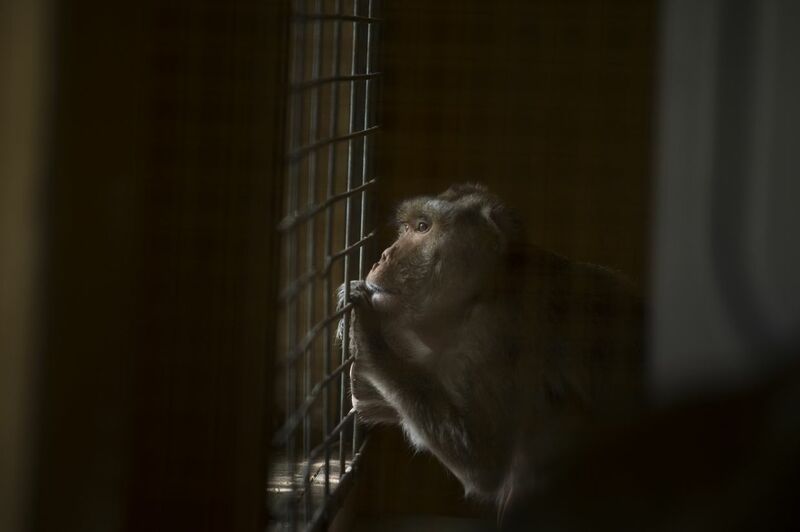 The sanctuary has one monkey, a 16-year-old Japanese macaque named Lexy, who came from an illegal roadside zoo. Lexy gave birth there and her baby was taken away and sold. She now carries a doll around her enclosure, grooming it, as though it were her child. Monkeys that aren’t raised properly also lack confidence. Sarah Iannicello, a volunteer at the sanctuary who studied orangutans in Borneo, said the difference between the ones reared in the wild and those raised in captivity is stark. “Wild primates have this booming confidence and they look at you like you are nothing. Whereas the ones here are kind of, they’re damaged in different ways. So a lot of them, they’ll self-harm and they’re not nearly as confident,” Ms. Iannicello said. A day after the fight, Pugsley is moved to an adjacent area to allow his wounds to heal and to ease the tensions. Cedric is at the fence, grooming the injured monkey through the wire. Cody is sitting up on the hanging platform, refusing to look at them. Monkeys spend 10 per cent of their day grooming each other – a sign of care, trust and maintenance of their social network. The grooming calms them. A monkey’s heart rate will actually slow as it’s being tended to by another. In Cedric’s case, it’s a sign of concern for Pugsley’s condition. Pugsley fought back, but to no avail. Cody, the meek one, was now asserting himself and Pugsley needed to be taught a lesson. Cedric, left, exchanges a glance with Pugsley. Three weeks after the fight, a semblance of order returned to the group. It was mid-July and Pugsley’s wounds, though tender, were on the mend. The three were hanging out together once again, grooming and foraging. There were small scrapes on Cedric and Cody, suggesting they too had had tussled, but their body language indicated the problem had been resolved. Pugsley, meanwhile, was duly chastened. “He’s realizing there are limitations to what the others will allow him,” Ms. Liepa said. Off in one corner of the enclosure, Pugsley sat by himself, staring into a mirror – a favourite pastime of his. Scientists believe apes can recognize their own reflections, but aren’t sure if monkeys can. In 1970, psychologist Gordon Gallup conducted what he called the “rouge test,” painting a red dot on the forehead of anesthetized chimpanzees. When they awoke and saw themselves in a mirror, the chimps immediately tried to rub the mark off, suggesting they understood that the image they saw was them. Monkeys didn’t respond to the smudge. But was it because they didn’t reach the same conclusion as the apes, or that the monkeys simply didn’t care about the smudge? It’s a debate that’s never been settled. Ms. Meehan is convinced that when Pugsley stares into the mirror, he knows it’s him. Following the fight, he also appeared to use the mirror to keep an eye on what the other monkeys were doing behind him. Pugsley was no dummy. Pugsley sits by a window in the enclosure. He is captivated by mirrors, which he appears to use to keep an eye on his fellow monkeys. Though Pugsley enjoyed the mirrors he played with at the lab, the monkeys mostly ignored the things that came with them, such as a ball and a rubber chew toy. Instead, they spent time catching flies in their hands and leaping from the plastic playhouse to the hanging platform – a feat that wouldn’t have been possible only a few months previously. Now that they no longer spent the day crouched in cages, their balance and strength was slowly improving. To keep their minds busy, their meals at the sanctuary started to arrive in puzzle form. Fruits, vegetables and nuts were placed into small containers and boxes, which were then put into a larger paper bag, requiring them to work for the food. It’s a proxy for foraging in the wild, where macaques spend much of their day picking through the grass or rummaging in the foliage for sustenance. Perhaps the most important element of their rehabilitation, though, was to keep the monkeys’ minds off the lab, to avoid triggering their memory. At her sanctuary in Wisconsin, which houses five former U.S. research monkeys, Amy Kerwin saw firsthand the risks of doing so. When she decided to store the monkeys’ old cages from the lab near their enclosure, the mere sight had a disastrous effect. Ms. Kerwin’s own story began in a lab. Long before she founded a sanctuary, the soft-spoken Midwesterner was an aspiring veterinarian, studying at the nearby University of Wisconsin-Madison. She had grown up around animal research. Her father was a teratologist – a scientist who studies human congenital abnormalities. His research on birth defects in monkeys at a lab in Cincinnati was instrumental in the fight against thalidomide. She landed a job at the university’s primate lab, which housed 2,000 monkeys, including 97 in the division Ms. Kerwin was assigned to. She was devoted to the work, but believed there were ways to do it better, particularly with how the monkeys were handled. Any time a monkey had to be removed from its cage, if it didn’t come willingly it was threatened with a metal pole, and then with a net, which often caused the other monkeys to panic. When she asked one of the senior staff why the monkeys couldn’t be given better conditions, Ms. Kerwin said her colleagues grew suspicious. In hushed tones, they asked if she was an activist. Ms. Kerwin believes in animal research if it might cure diseases like cancer, but some experiments, such as one she participated in where monkeys were fed alcohol, seemed pointless and frivolous, and the findings were questionable. Soon after she spoke up, Ms. Kerwin said she saw her hours trimmed, and her weekend security clearance revoked. She was no longer allowed to be in the lab alone. Her career prospects began to flag. Still wanting to work with monkeys, she left to start a sanctuary. Her predicament demonstrates the divisiveness in the debate over animals in science, where each side views the other as the enemy in a zero-sum argument. Even now, at her sanctuary, Ms. Kerwin said she’s been criticized by animal rights groups in Wisconsin who accuse her of enabling the research facilities by creating a dumping ground for lab monkeys. “We don’t take a stance on primate research. We stay in the middle. We say it’s the very least we can do while this exists,” she said. Ms. Kerwin also asks that each monkey come with funding – about $12,000 – to help in its retirement. Given the large profits tied to some of the pharmaceutical research, she believes this is reasonable, though the request is sometimes ignored. She sees her work as an extension of what her father did. She remembers going to his research facility as a child and seeing the rows of deformed foetuses in jars. Though she views her dad as a hero of modern medicine, his professional life took its toll. Her father drank heavily and died of alcoholism at 54. Now, she tries to help the monkeys at her sanctuary forget their past. But there can be unintended setbacks that materialize out of nowhere. One day, without realizing it, a volunteer donned rubber boots similar to the ones used in the research facility. Upon seeing them, a monkey named Izzle began to scream – Ack! Ack! Ack! – letting out a shrill warning call to the others, who then joined in. And if humans approach his cage too suddenly, a former lab monkey named Mars starts to bite his arm violently. But there’s only so much you can control. Back at Story Book Farm in Ontario, it was mid-afternoon when a low rumbling sound emerged off in the distance. The monkeys stopped in their tracks and watched as a large white cargo truck steered in their direction. They spotted it from 100 metres away, engine revving as it climbed the hill towards the sanctuary. The next 22 seconds were chaos. Immediately, the monkeys ran for cover. Cody darted toward the enclosure. The others followed, right on his tail. They scrambled through the open window. Cedric and Cody climbed into their bed, attempting to hide. Only Pugsley remained, perched on a ledge, looking out. His aggression, which had faded in recent weeks, returned in full force. He glared at the truck, jaw open, teeth bared. It was the first time since arriving at the sanctuary that the monkeys had acted this way. For some reason, the appearance of another big white truck set them off. The driver came to a stop 30 feet from their enclosure, oblivious to the alarm he’d just caused. A moment later, the truck pulled away. It was just a courier. A parcel was being delivered. The sanctuary, near Sunderland, Ont., is a pastoral setting, with rolling hills and swaying trees about a 20-minute drive from Lake Simcoe. Inside the farmhouse at the sanctuary hangs a large piece of cardboard in a brown wooden frame. It is an oversized greeting card, like the ones people get when they retire, signed by their co-workers. “It was an honour working with you boys,” says one inscription, written in purple felt pen. “I wish we could have met in other circumstances,” reads another, in green. Though the research facility is silent, refusing to talk about its work, each anonymous blurb helps add some context to the lab’s decision. “Time for us to pay it forward,” says one in purple. None of the writers signed their name. One inscription in particular stands out for Ms. Meehan though. Walking through the farmhouse, she stopped to point it out. That’s odd, Ms. Meehan said, furrowing her brow. Cedric never screams. He’s a quiet monkey. Why on earth would he have been screaming? It’s a question that continues to go unanswered. Though this is the only time the federal government has given its permission for research monkeys to retire from a lab, Ms. Liepa wants to make sure it’s not the last. She’s hoping the idea can lead to something more sustainable for Canada. To achieve that, more labs would have to be willing to step forward, crossing the philosophical divide between them and the sanctuary. For now, Cedric, Pugsley and Cody have set a precedent that could pave the way for future talks. It took a bureaucratic sleight of hand to get around the rules: because of their doomed status as research animals, the primates are technically on-loan to the sanctuary for the rest of their lives. Still, it’s not something the government is eager to talk about. The CFIA would only answer limited questions for this article, suggesting at one point that all details about the retirements were confidential. “In general, the CFIA does not allow this to happen. Monkeys are usually destroyed after their time as research animals,” a department spokeswoman said. The department acknowledged more could be retired using the same blueprint, if the opportunity arose. It’s a question of what those research animals are owed, if anything, for their pain. For now, humans need the monkeys to advance medical science. But do people have any responsibility in return? Troy Seidle, vice-president of research and toxicology at Humane Society International, is an optimist. Based on the current pace of scientific advancement, he believes most animal research will be replaced by technology such as computer models and human cell cultures within his lifetime. Several months into their retirement, the monkeys have shown remarkable progress. They have sprouted thicker crowns of hair – a particular trait of their breed – and the whiskers on their face have grown bushier, a sign of robust health. Staff at the sanctuary also noticed a change in the monkeys’ faces. For the first time in their lives, away from the artificial lights of the lab, they are getting tans. When a thunderstorm rolled in late one evening, something unusual happened. As rain pelted the property, Ms. Meehan went to check if the monkeys were indoors. But while all the other primates at the sanctuary had taken shelter from the storm, three figures sat outside in the darkness, huddled close together. Cedric, Pugsley and Cody gazed up at the sky and allowed themselves to get drenched. There was thunder and lightning, but it didn’t seem to matter. This was what rain felt like. Story Book Farm’s director, Daina Liepa, describes the monkeys' personalities and the new life they’ve found after captivity as lab animals.